Richard was born in Droitwich in 1197 and studied at Oxford University where he became a friend of his tutor, Edmund Rich, who in 1236, when he was Archbishop of Canterbury, appointed Richard as Chancellor of the Province of Canterbury. They had to flee to Europe after a quarrel with Henry III. Edmund died and Richard was ordained by the Bishop of Orleans. He returned to Kent as a parish priest. Named as Bishop of Chichester in 1244, he was forced by the King’s enmity to become a wanderer in his own diocese, dependent on charity. He finally succeeded to the bishopric in 1247. 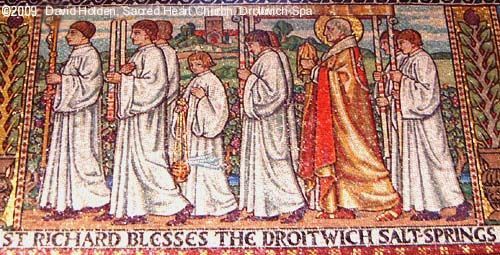 During one of his return visits to Droitwich, sometime between 1247 and 1249, his episcopal blessing on the dried up brine springs miraculously caused them to flow again, much to the relief of the town. After a life of poverty and humility, Richard died on 3rd April 1253. When his body was prepared for burial it was found to be clothed in horsehair, held by iron bands. The Pope canonized Richard on 22nd January 1262. More about the local Salt Industry may be found in the section about Local Industry. 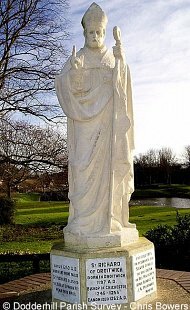 Statue of Saint Richard de Wyche in Vines Park, Droitwich Spa.